At Diamond Bar Dental Group, we provide the best dental care you deserve. We offer state of the art dental technology and techniques - When you entrust us with your dental care, we will utilize the latest technologically advanced dentistry offering you and your family an opportunity to gain a natural looking healthy smile for a lifetime. Diamond Bar Dental Group utilizes state of the art digital x-ray and transillumination technology, this technology offers the highest quality dianostic tools, minimizing exposure time by about 50% compared to traditional film x-rays and illuminates the inside of your teeth to identify cracks and lesions in your tooth in its earliest stages - in addition, the images can be seen on a computer monitor, enhanced for superior visibility, and electronically stored and retrieved. Because digital x-rays are electronically stored, it's easy to keep it as part of your dental history, and can be easily sent should you need to see a specialist or if you are traveling and need to see a dentist in an emergency. Dexis TM uses a patented PureImage TM technology that delivers extremely clear, sharp and highly detailed images for a more comprehensive diagnosis than with traditional xray. Dexis CariVu TM is a new preventative approach to discovering cavities and cracks in there earliest stages. The CariVu device is a detection device that uses a patented transillumination technology to support the identification of occlusal, interproximal and recurrent carious lesions and cracks at its earliest stages and with very high accuracy. Transillumination technology allows the dentist to see through the tooth with the healthy enamel appearing transparent and the diseased part of the tooth structure absorbing the light and appearing as a dark lesion or line if there is a crack in the tooth. 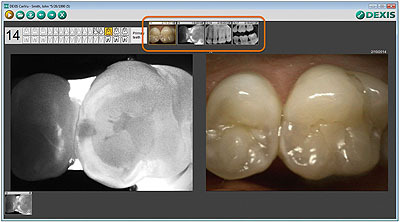 When used together, a digital xray, a transilluminated image and an intraoral photo provide a comprehensive picture of the health of your teeth. Soft tissue lasers are a versatile dental technology that can be used for a number of procedures. Unlike conventional treatments, which require cutting and sutures, the soft tissue laser allows for effective treatment without any incisions resulting in faster healing times with less discomfort. This unique tool uses a micro pulsed diode laser which creates minimal stress on the gums and reduces both procedural and post-operative discomfort. AMD Picasso LASER – Award Winning Picasso Laser Technology offers unprecedented versatility performing a wide variety of Soft-Tissue and Periodontal Procedures. We can now deliver many soft tissue treatments: reshaping gums and crown lengthening, removing bacteria from gum tissue, relieving cold sores and lesions and implants with more patient comfort, less anesthesia, better precision and a faster recovery time for our patients.